England Test captain Joe Root has hailed the dressing room environment at Yorkshire and admits he can’t wait to get back there next week. Root is inked in to play two Specsavers County Championship matches before the summer internationals begin against Pakistan next month. He faces away fixtures against champions Essex and Surrey at Chelmsford and the Kia Oval respectively, the first of which starts a week on Friday. “They are two big games,” he said, going on to back the White Rose county for success in 2018. “I always love coming back and playing for Yorkshire. I’ve got some really strong mates who I’ve played all the way through with, from being 15-years-old. 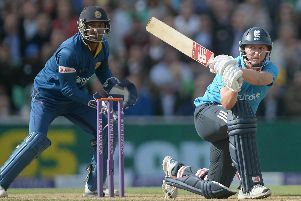 The 27-year-old Sheffield batsman went on: “I’m always following what’s going on. Root returns to county duty alongside Bairstow, and they will be hoping join a side on a winning roll. Having beaten Nottinghamshire by 164 runs at Emerald Headingley on Monday, they travel to Taunton to face Somerset on Friday aiming to make it two wins from three matches this summer. After the Essex and Surrey fixtures, Root and Bairstow will face Pakistan in a two-Test Match series. Although Yorkshire fans may not be seeing the pair wearing the White Rose on home soil, they will have the chance to see them in the second Test against Pakistan at Emerald Headingley from June 1-5. It starts a busy summer of internationals, with Australia and India also visiting, the latter for the second summer Test series. And Root is confident of a return to form for England after defeats in Australia and New Zealand this winter. “It’s been a tough winter, but we’re playing at home. In our own conditions, we’re a very good side,” he insisted. “I expect us to go out there and perform really well. Back to Yorkshire matters, and they head to Taunton on Friday hoping for a similar outcome to last June when they won a thriller by three runs. It proved to be the crucial as they narrowly avoided relegation to Division Two come the end of September. Somerset won their opening round match against Worcestershire inside three days on Sunday, with their overseas Australian batsman Matthew Renshaw scoring a debut century. Renshaw was born in Middlesbrough before his parents emigrated, and he is a childhood friend of Root’s with the pair’s parents having played together at Sheffield Collegiate. Coach Andrew Gale added: “Taunton is always a tough place to go. Gale did not include a frontline spinner in his squad for the first two Championship matches against Essex and Notts at Headingley. But Azeem Rafiq and Karl Carver will come into contention, despite Gale’s comments regarding Taunton conditions. Seamers Steve Patterson and Matthew Fisher remain unavailable as they recover from a broken finger and a torn side respectively.